During my wonderful pool time down in Puerto Los Cabos, Mexico last week I had a conversation with a very friendly couple from Canada. They were surprised to hear how negative I was on the United States economy and its future, considering we were surrounded mostly by the "1 percent" who are very happy with the way things are proceeding. I discussed how I enjoyed diversifying into Canadian dollars whenever there was a large sell off in the currency markets. As a quick side note, I am not some super nerd that only discusses finance in my personal life. They were the ones that continued to bring it up, so it was not my fault. 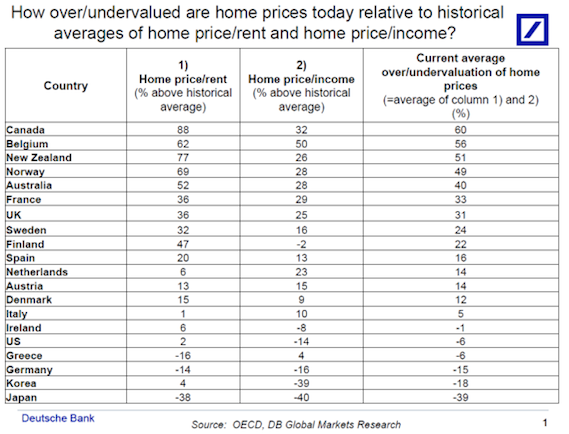 The Canadian housing market, outside of some ridiculously bubblicious cities in China, is arguably the most expensive housing market in the world. 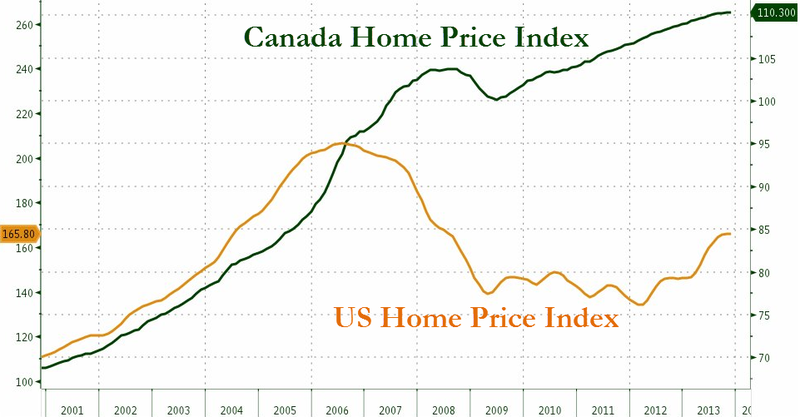 The following shows the Canada House Price index vs. the United States. While prices in the U.S. fell in 2008 through 2012, Canada homes continued to rise. Rising home prices increase the desire for citizens to take on more debt. This can be seen in the household debt to GDP ratio, which has continued to rise in Canada well past where the U.S. peaked back in 2008. Canada's government debt to GDP is currently 84%, which is higher than most emerging markets but lower than many of the developed countries. Why is the government debt to GDP important? Federal mortgage insurance was introduced in Canada in 1954 to provide protection for the banks against mortgage defaults. Mortgage loans with less than 20% down require this insurance and some lenders even require it for loans with greater than 20% down. While there was some question how the United States would handle its real estate meltdown (would they socialize the entire banking system and GSE's? - they did), in Canada there is no question. As soon as the losses begin, the government is on the hook. This makes Canada's lower government debt to GDP important. As their real estate market crashes, the government will need to raise money both to fund bank losses and stimulate the economy. A large portion of their GDP is tied to real estate activity, which will contract as the real estate market crashes (7.5% of the Canadian workforce is in construction and 7% of the total economy is based on residential construction). By the way, this is not what I feel their government should do. What they should do is remove the insurance completely going forward and step away from supporting the real estate market. Prices will crash and the economy will contract far more in the short term. Their toxic debt will cleanse. This will allow them to begin to grow again under a strong foundation. Unfortunately, what should be done does not happen in our modern world today. There is not one (current) politician on the planet that is willing to make the tough decisions and do what is right for their country in the long term (the Iceland leaders being the exception). Therefore, I base all conversations around what will happen, not whine about what should happen. 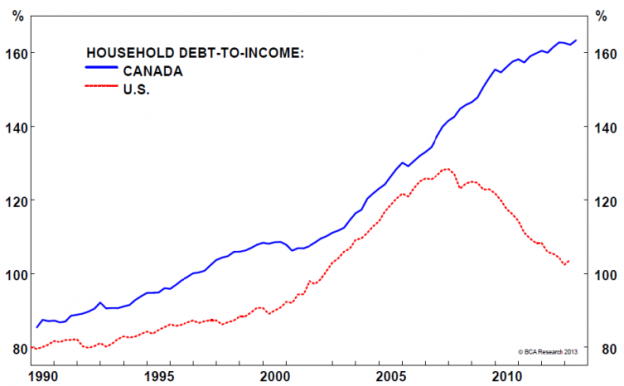 While Canada's banks will be protected, the household sector will be crushed. My personal hope is that their currency will move far lower in the short term against the U.S. dollar as foreign investment flees their real estate markets. The coming sell-off will be a tremendous opportunity to diversify in to the Canadian dollar. Depending on the magnitude of the sell-off in their real estate and stock markets there may be excellent opportunities in those asset classes as well. In the short term, stay on the sidelines. Tuna, timely update, thanks. Any thoughts on this article? I think it would be shocking if they took an across the board deposit haircut when they have the ability to fire up the printing press at the European Central Bank. While I have no idea how this disaster will play out, I think debt monetization is more likely than depositor confiscation. What should they do (which they never will)? Let the banks fail and protect any citizen deposits that are insured. Liquidate the remaining assets and let the free market take care of the rest. It would lead to a massive world wide depression. Then we would hit bottom and grow in a healthy manner.